Congratulations to Amy Hammett, Maize High School Science Teacher, who received a $500 check as the statewide winner of the 2018 Wendell G. Mohling Foundation Scholarship Award at the USD 266 School Board Meeting on November 12th. The award was presented by scholarship founder Carol Mohling, Kay Neill, chair of the foundation, and Marlin Weyer, foundation board member. The $500 award is given annually to a Kansas science teacher to be used to increase his/her professional development by attending a national or regional National Science Teachers Association Conference on Science Education. Mrs. Hammett completed an application essay to vie for the award, and has chosen to attend the NSTA National Conference in St. Louis, Missouri, on April 11-14, 2019. In her essay she explained that this conference would give her the opportunity “to learn with and from other science teachers from around the nation”. The $500 award is given annually to a Kansas science teacher to be used to increase professional development by attending a national or regional National Science Teachers Association Conference on Science Education. The scholarship foundation was started by Carol Mohling in honor of her husband, Wendell G. Mohling, after his death ten years ago. Dr. Mohling was a former Kansas Association of Teachers of Science President and NSTA President, and was well known for his environmental education classes and outdoor lab that he designed as a teacher at Shawnee Mission Northwest High School. Dr. Mohling's vision was for Kansas science teachers to experience the excitement of attending a national or regional conference. The Foundation honors the memory of Wendell Mohling by awarding a $500 scholarship to one Kansas teacher of science annually. Their website, www.wendellmohlingfoundation.com, explains that Dr. Mohling knew from experience the personal and professional benefits gained by attending conventions. As a teacher, he also knew the financial burden of finding the money to attend conventions. The award also provides the winners with a membership for the year to the Kansas Association of Teachers of Science (KATS). This membership will provide her with numerous statewide opportunities for professional development. 2017 - Maria Cricket Henderson and Betsy Lawrence, Maria Cricket Henderson teaches Science and Environmental Education, grades 1-12 at the Kickapoo Nation School in Powhattan, KS. One of her teaching goals is to help the students reconnect to their heritage and renew their bonds to the land in this era of technology consumers. She states that Science is exciting, relevant and fun. All subjects can be taught under the heading of Science, especially when it is hands on learning. The second winner of the 2017 award is Betsy Lawrence, a sixth grade science teacher at Eudora Middle School. Betsy was presented the award at the USD 491 School Board meeting on December 14th. Mrs. Lawrence has chosen to attend the NSTA National Conference in Atlanta, Georgia. In her essay she explained that this conference will give her the opportunity to stay current on best science teaching practices, as the convention provides many avenues to hear new ways to teach science. th. The $500 checks were presented by the scholarship award founder Carol Mohling and chair of the foundation, Kay Neill. 2016 - Laura Leis, a fifth grade science teacher at Smoky Valley Middle School in Lindsborg, was presented a $500 check as the statewide winner of the 2016 Wendell G. Mohling Foundation Scholarship Award at the USD 400 School Board Meeting on November 14th. The check was presented by the scholarship award founder Carol Mohling and chair of the foundation, Kay Neill. 2015 - Nancy Lee Smith, First grade teacher at Bentwood Elementary in Olathe, was presented a $500 check as the statewide winner of the 2015 Wendell G. Mohling Foundation Scholarship Award at the Olathe School Board Meeting on November 5th. The check was presented by the scholarship award founder Carol Mohling and chair of the foundation, Kay Neill. Nancy chose to attend the NSTA National Conference, held in Nashville. 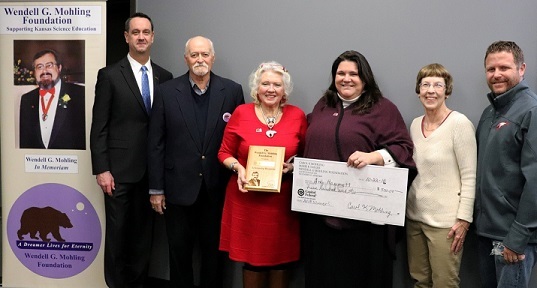 2014 - Stacy Harris, Eighth grade Science Teacher at Susan B. Anthony Middle School, was presented a $500 check as the statewide winner of the 2014 Wendell G. Mohling Foundation Scholarship Award at the USD 383 School Board Meeting in Manhattan on November 5th. The check was presented by the scholarship award founder Carol Mohling and chair of the foundation, Kay Neill. Ms Harris chose to attend the NSTA National Conference, held in Chicago on March 12, 2015. 2013 - Nathan Bonham, Norwich School Science Teacher, was presented a $500 check as the statewide winner of the Wendell G. Mohling Foundation Scholarship Award at the USD 331 School Board Meeting in Kingman on November 11th. The check was presented by the scholarship award founder Carol Mohling and chair of the foundation, Kay Neill. He chose to attend the NSTA Regional Conference, held in Denver on December 12, 2013. 2012 - Judy Wilson, a fourth grade science teacher at Amelia Earhart Elementary in Goddard, was presented the prestigious Wendell G. Mohling Foundation Scholarship Award for 2012, during an assembly at her school on Wednesday, September 19th, by Carol Mohling. Natalie Rust, Principal at Amelia Earhart, wrote in her letter of support, Mrs. Wilson stays current with trends and provides a lot of hands-on opportunities within her program. I would be delighted to send her to a conference that could enhance the program even more. The Goddard School District values the Science programs and is always seeking staff development opportunities to enhance the programs. In her application essay, Judy explains how the conference will help her professionally. Working on Math and Engineering ideas to enhance our science instruction is very important, and I would be looking for classes that emphasize these areas to enhance our curriculum. I will be adding iPads to my science room, and will be looking for ways to use them more effectively. Also, I do a science fair with my fourth grade students each year. I would love to network with others that do science fairs at their schools so that my program will grow and improve. This award was also bestowed in 2009 to another USD 265 educator, Denise Scribner, who teaches science at Eisenhower High School. The Kansas Association of Teachers of Science has been very supportive of the foundation in furthering its mission to help Kansas science teachers. 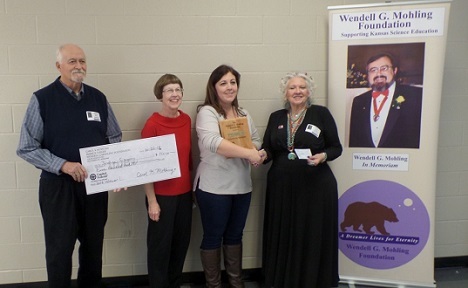 2011 - Brenda K. Kuhns, an eighth grade science teacher at Jardine Technology Middle School in Wichita, was presented the Wendell G. Mohling Foundation Scholarship Award at her school on Tuesday, November 8, 2011, by Carol Mohling. The award of $500.00 is given yearly to a Kansas science teacher. Brenda is planning on attending the national meeting in Indianapolis at the end of March. In her application essay, Brenda explains how the conference will help her professionally. Not only will attending the convention add increased relevance and rigor to my classroom, I will also be able to share the resources and excitement with other science teachers in my building and throughout the district. The foundation was set up to honor Wendell G. Mohling after his death six years ago. Dr. Mohling was a former KATS (Kansas Association of Teachers of Science) President, and NSTA President, and was well known for his environmental education classes and outdoor lab that he designed at Shawnee Mission Northwest High School. Wendell's vision was for Kansas science teachers to be able to experience the excitement of attending a national or regional conference. The Kansas Association of Teachers of Science has been very supportive of the foundation in furthering its mission to help Kansas science teachers. 2010 - Karin Versteeg, a Science teacher at Derby Sixth Grade Center USD 260, was presented the Wendell G. Mohling Foundation Scholarship Award on October 25, 2010. 2009 - Denise Scribner, a biology and environmental science teacher at Goddard High School, was presented the Wendell G. Mohling Foundation Scholarship Award on Tuesday, October 13th, 2009. 2008 - Boyd G. Koehn, special education resource teacher West Elk High School, was presented the Wendell G. Mohling Foundation Scholarship Award on Friday, September 19, 2008. 2007 - Jennifer Howard, science teacher at Truesdell Middle School, Wichita, was awarded the 2007 Wendell G.Mohling Foundation Award. 2006 - Chitra Harris, Wichita South High School science teacher, Chitra Harris, was awarded the first Wendell G. Mohling Foundation Scholarship in 2006.